For a while now my knitting time has been limited; I've only be able to get in a few rows here, a few rows there, and sometimes even just getting my project together is as far as I get. I'm still working Geschenk, its coming along nicely, I've got about 3 repeats done of the 3rd chart. I'll share that soon. While browsing through my FB Feeds, I came across a new project, a Mystery at that! It's so hard for me to avoid a good mystery knit. This was inspired by Marisol's FB post, thus I headed down to the yarn store on none other than Small Business Saturday! While I didn't need yarn to buy for this project, I felt the compulsion to buy new yarn. It literally had been many many months prior to that since my last yarn purchase, amazing, but true! 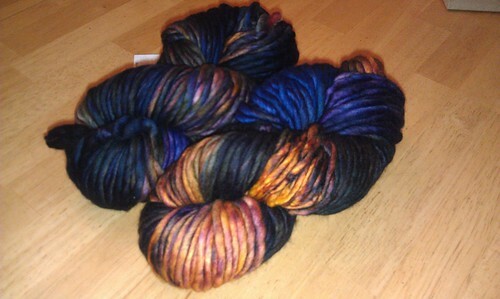 I picked up these lovelies, Malabrigo Rasta in Soriano. 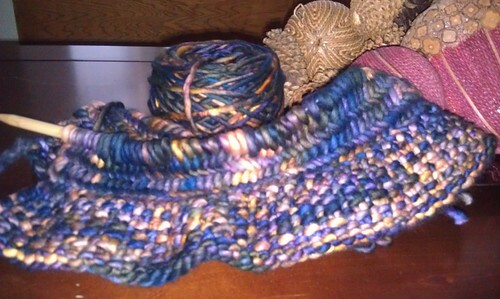 I absolutely love the Rasta from Malabrigo, so soft and such gorgeous colors. The Mystery cowl knits up fast, I finished the 1st clue Sunday! I finished the 2nd clue yesterday evening, no pics yet, but tonight I'll start the last clue. It'll be any day now that I'll be sharing a fabolous new FO! BTW, this Mystery Cowl KAL is hosted by Star Athena, who has such lovely patterns! I love a fast knit, it's great to regain your knitting rhythm.